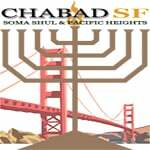 Chabad of Pacific Heights is dedicated to serving the Pacific Heights community through programs such as Friday Night Live, Prayer Services, Mitzvah Cable Car and Minyan-air Club, Jewish Women's Circle of Pacific Heights, Torah Classes, CTeen, Mezuzah Campaign, Home Visitations, Senior Support, Shab-box and more! Chabad of Pacific Heights is run by Rabbi Moshe Langer and his wife Taliah. You can reach Rabbi Langer at: (415) 987-8355, or via email at moshe@chabadsf.org.